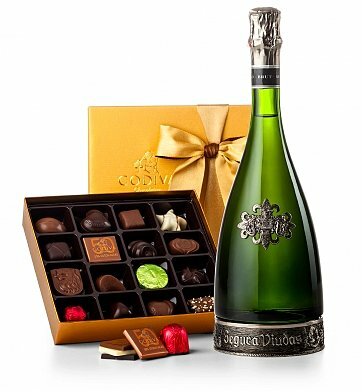 Known as the crown jewel of the Segura Viudas estate, this pewter-accented bottle of highly-rated Reserva Heredad Cava shines beautifully alongside a golden arrangement of Godiva's finest chocolates. One bottle of Segura Viudas Reserva Heredad Cava. For more information on this champagne, please see the Tasting Notes. Godiva's Gold Ballotin 19 Piece Chocolate Gift Collection. Measures 17" x 5" x 5"
Segura Viudas Champagne and Godiva Chocolates is a hand delivered gift. These gifts are delivered by one of our local design centers located throughout the United States and Canada. Same day delivery is available for most gifts when ordered before the cutoff time. The cutoff time for Segura Viudas Champagne and Godiva Chocolates is 1 PM in the recipient's time zone. Segura Viudas Brut Reserva Heredad CavaThe renowned Spanish cava presented in a hand blown bottle with pewter accents. Macabeo and Parellada grapes are blended to create an almost Chardonnay-like sparkler. Rich and complex with a dry depth of smoky minerality, this heady cava delivers fresh apple-skin notes and toast in a beautifully presented hand blown bottle with pewter accents. Segura Viudas Reserva Heredad Cava in Pewter Accented Bottle. Arrives beautifully packaged for an impressive gift presentation. Nicely presented and perfect delivery timing. These were purchased for 25 year employees, I had delivered to their hotel rooms prior to arrival, and they were thrilled and awed by the bottle and chocolate. The engraved tag made it personal and complete. They were so beautiful, the employees thought the resort had prepared the gifts! Very well received, very beautiful presentation with the keepsake bottle too. I'd recommend this to anyone. GiftTree service and delivery was spectacular as well - a day early even! Lovely presentation. My friend absolutely loved this birthday gift. Lovely . I will definitely shop here again. Birthday gift for a woman who has everything! I have never ordered from GiftTree before, but was looking for an unusual gift for a woman who has everything. I came across their website by chance. I was delighted with their choices. I ordered, and was again surprised with the communication about the delivery. I was notified that the first delivery didn't work because no one was home to sign for it. The next day I was notified that it had been delivered. No checking or tracking of package. Will definitely order again from this company! My niece and her husband loved the champagne and Godiva chocolates. Thank You! This was a great thank you gift and the recipient said its the first time he'd received champagne and chocolates so beautifully gift wrapped. That was totally unexpected but appreciated! The recipients of this gift loved not only its presentation, but also the taste! Very classy gift, thanks! I received this dual as a birthday gift from some dear friends. I have not opened the champagne yet. I am saving for a special occasion probably 12/16/15 on my birthday. What a WONDERFUL gift that will be remembered for a long time. The Godiva chocolates are just as pictured (almost too pretty to eat)! Thank you again to my dear friends and to the Gift Tree. I ordered this for my daughter who would be celebrating her 21st in America. I was very impressed with the website which was easy to navigate around and the item was delivered on the day I wanted it to be delivered. I was shown the items when we skyped and the bottle was so lovely that she is going to keep it as a keepsake of her 21st. Would definitely use this website again. THE GIFT WAS BEAUTIFUL! I WAS NOT DISAPPOINTED WITH MY CHOICE. High quality gift for special occasions. My recipients were delighted and contacted me immediately with appreciation...lots of ooh's and aah's! I will definitely be ordering this gift in the future. GiftTree's on-line and follow through experience was outstanding! Sent this to my sister and aunt who celebrate christmas together. They loved it! Had a ball opening gifts and sipping bubbly while eating great chocolate! We received a call from our granddaughter that this had arrived. "I can't drink that, it's too nice!" was her comment. This was a little gift to start her college graduation weekend and she was so surprised and pleased. Thank you! I sent this beautiful gift to my parents for their 60th Wedding Anniversary. They absolutely loved the delicious chocolates and champagne and plan to keep the beautiful bottle as a keepsake. My BFF could not have been more ecstatic to recieve this gift from me for her 60th birthday! What better way to get out of the dumps of being older than with champagne and chocolate?!? She also raved on how beautiful the bottle was. Thank you for helping me make her day as special as she is. This gift received raved reviews! Delicious chocolates and bubbly! GiftTree kept me informed regarding the shipping and delivery status. Well done and I will order from GiftTree.com again!! We sent five of these to employees of a company that we do business with on a regular basis as holiday gifts. These gifts were well received - we received personal Thanks from all of them and they were surprised and pleased to get such nice gifts. We will definitely be ordering from Gift Tree again when we want to send an impressive gift. Amber was both courteous and professional making our ordering experience pleasant. I ordered this product for a good friend of mine and it was delivered 2 days later. The item is exactly as described and it looks even better than the picture. It came well packaged and gift wrapped. I couldn't be happier. GiftTree is definitely first on my life for any occasions throughout the year. Very happy with the products, service and the options the company has available in terms of gifts. I recommend this item.